Vertical design compressors create huge air volume from the smallest possible floor footprint. Ideal for the shop or garage where it can be stored yet used, the PCE6200 has a 20 gallon, electro-statically paint tank while its oil lubricated pump affords the user hours of operation with little or no maintenance. Creating maximum pressure of 115 PSI while producing CFMs of 6.2 @ 40 and 5.2 @ 90, the PCE6200 is designed for longer duration projects. With dual pressure gauges and dual brass quick connect couplers and both a handle and wheels for ease of relocation near the job this unit is great for big jobs yet compact enough for convenient storage. The Campbell Hausfeld 20 Gallon 3.7HP horizontal portable air compressor (VT6182) powers a variety of air tools for the serious do-it-yourselfer, professional, or contractor. Product life up to 5,000 hours. Durable and safe ASME code tank for greater storage. The cast iron pump delivers 10.2 CFM at 90 PSI and is designed for long life and durability. This AC1200 3 Gallon DC Motor Oil-Free Air Compressor has a 50/50 duty cycle and features a built in quick connect hose coupler and is ready to work when you are. Max Pressure of 100 PSI with Air delivery of 0.6 CFM@40 PSI, 0.5 CFM@90 PSI. The simple, lightweight design is ideal for dusting, inflation, stapling, finishing nailers, airbrushing, car & bike tires, upholsteryand cleaning workbench areas and equipment. Contractor grade compressors can be utilized for a myriad of purposes, but are primarily engineered to power nail-guns. The Husky 20 Gal. compressor features a high performance pump and motor that delivers 175 max PSI along with 4.0 SCFM at 90 PSI. Higher PSI equates to longer air tool run times and increased project efficiency while the quiet operation at 83 dBA brings less noise to your work environment. 7 in. wheels make the unit portable in your shop or garage and the fully enclosed motor and pump shroud protects all vital components. The Husky 20 Gal. 175 PSI compressor is perfect for all inflation tasks, nailing and stapling, automotive applications and medium duty spray painting tasks. 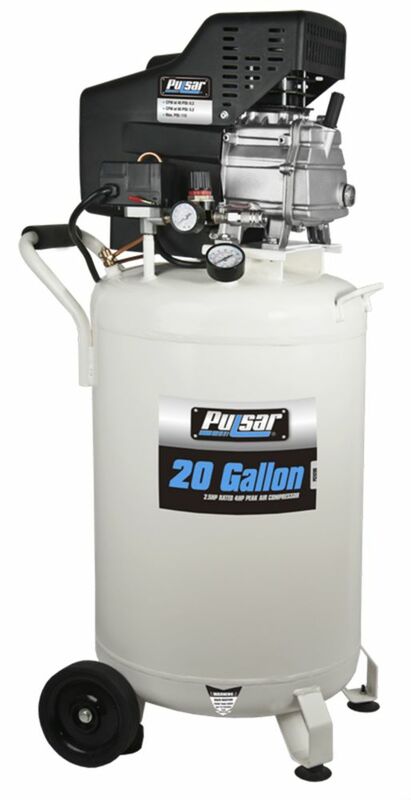 Pulsar 20 gallon Air Compressor Vertical design compressors create huge air volume from the smallest possible floor footprint. Ideal for the shop or garage where it can be stored yet used, the PCE6200 has a 20 gallon, electro-statically paint tank while its oil lubricated pump affords the user hours of operation with little or no maintenance. Creating maximum pressure of 115 PSI while producing CFMs of 6.2 @ 40 and 5.2 @ 90, the PCE6200 is designed for longer duration projects. With dual pressure gauges and dual brass quick connect couplers and both a handle and wheels for ease of relocation near the job this unit is great for big jobs yet compact enough for convenient storage.